With the Scottish Marine Protected Area (MPA) Project firmly underway it will become increasingly important to understand how marine protected areas will perform in future scenarios of climate change. How will climate change affect MPAs and are we planning for it? Impacts on the oceans from climate change, such as melting sea ice and the plight of polar bears, or rising sea temperatures and coral bleaching, are well publicised. However, climate change is also affecting the functioning of marine ecosystems in other ways; sea level rise, changes in weather patterns and changes in ocean currents are also altering ocean conditions. Species shifting their distribution in response to these changes may not be protected by traditional marine protected areas. Although marine protected areas cannot guard against alterations in sea temperature for example, through reducing other stressors such as overfishing MPAs may mitigate the effects of climate change and are still an important long-term conservation tool. Questions about marine protected areas and climate change are only just being addressed and current planning and management regimes may not be able to cope with the pressures of climate change. Managers will need to think strategically with carefully designed socioeconomic and conservation goals. Monitoring and adaptive management will be key facets in promoting climate change resilience and ecological integrity. As a PhD student I will be aiming to answer some of the important management and policy questions of marine protected areas in the context of climate change. MPAs have been delivering results worldwide and using the vast experience from international examples will be key to understanding how climate change considerations can be applied to the Scottish process. This PhD will be supported by Climate XChange (CXC) to provide timely information relating to MPAs and climate change. I am working closely with the Centre for Sustainable Coasts a joint initiative between the James Hutton Institute (JHI) and SAMS addressing marine policy in Scotland. For updates, check out Charlotte Hopkin’s blog – Bonnie Buoyancy. Environment groups have expressed deep concern about the sector-led planning that threatens to sideline Scotland’s marine environment and the national sustainability agenda. Members of Scottish Environment LINK argue that delays to finalising a National Marine Plan will favour short-termist, large-scale development without ensuring due consideration of wider environmental impacts and the interests of broader marine activities. A pioneering programme, fitting tiny sat-nav style tags to seabirds, is the inspiration behind a new exhibition opening this weekend at Glasgow’s Kelvingrove Art Gallery & Museum. The Future of the Atlantic Marine Environment (FAME) project saw scientists, from organisations such as the RSPB, attaching small tracking devices in order to find and protect important feeding areas for seabirds. The ground breaking data has furthered knowledge for seabird conservation and has also inspired a group of artists to stage an exhibition. 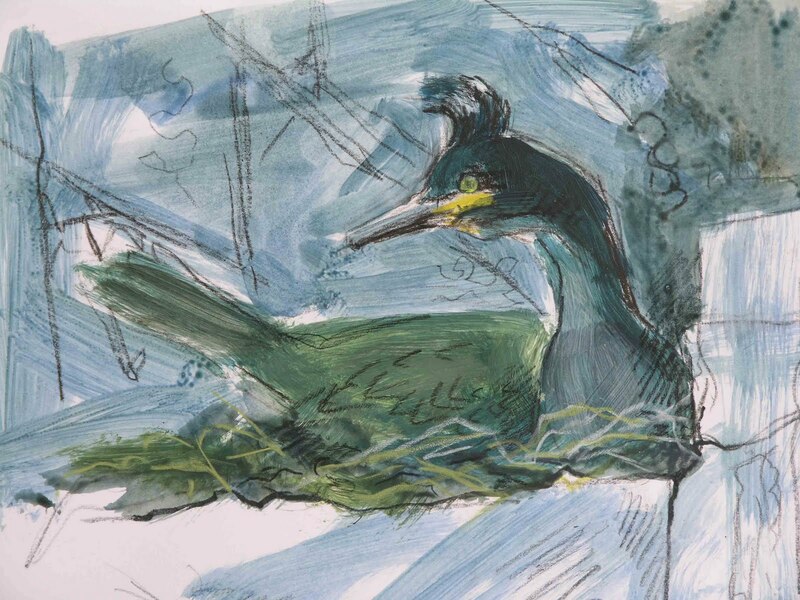 ‘Sea art in a different way’ is the brainchild of wildlife artist Jane Smith and RSPB Conservation Scientist Ellie Owen, following a chance meeting on the seabird cliffs of Colonsay. Marine Protected Areas (MPAs) are vital to manage our precious marine resource and protect the biodiversity of our seas. In spring 2013 the Scottish Government will be consulting on proposals for a MPA network, but unfortunately proposals for the network do not include specific protection for feeding areas for birds at sea. RSPB Scotland is deeply concerned by this gap as many of Scotland’s seabird populations are in decline and has launched a petition for the inclusion of seabird protection in the MPA network. Come along to the FAME exhibition and be inspired to support protection for seabirds at sea. The ‘SEA art in a different way’ exhibition runs from 13 -21 October and entry is free. The influence of the environmental sector in getting the Marine (Scotland) Act 2010 on to the statute book was considerable and it was a major achievement. Everyone is now focussed on the precise delineation of and the powers to be exercised in the Marine Protected Areas (MPAs). I share the view that this is a substantial opportunity to effect a major policy shift in the sustainable management of our seas with enforceable controls that put environmental considerations at the heart of the process. MPAs can help put the 21st century ambition of the Marine Scotland Act into practice. I’m very glad LINK has launched the Save Scottish Seas website to attract as much support as possible for measures that will make a difference. I think, however, that there is a great deal of work to be done to make the positive case not only for an ecologically coherent MPA network but also that the management measures are tightly drawn and clearly enforceable. This will inevitably draw stiff opposition and this should not be underestimated. The already cogent arguments in favour of MPAs still stand: long term protection of the marine resource, upon which fishermen and many other economic activities rely, as well as the duty to be stewards of our environment for future generations. But these arguments need to be refashioned so that they can be fully understood by a wider audience and command the support of that wider audience. This will require everyone’s openness, patience and collaboration and the support and courage of our representatives. Ross Finnie, President of Scottish Environment LINK. A NUMBER of Scotland’s leading wildlife tourism businesses are calling on the Scottish Government to do more to protect and restore Scotland’s seas. Representatives of more than 20 organisations have sent a joint letter to Fergus Ewing, Scotland’s Minister for Tourism, highlighting the substantial economic benefits provided by the country’s most fragile ecosystems and demanding the establishment of a network of Marine Protected Areas (MPAs) along Scotland’s coast. MCS has been busy in June with two Seasearch trips and a book launch. On 15-18 June we surveyed new sites in outer Loch Linnhe, Sound of Mull, north Ardnamurchan and Muck, and recorded fireworks anemones, Celtic featherstars and northern sea fans across various sites. Most spectacular was a reef west of Elizabeth rock descending to 40m and beyond covered in jewel anemones with northern sea fans at the base. We were also very lucky to see a sea eagle with two nesting chicks. where we managed to confirm the presence of waves of maerl gravel (5% live) suspected from historic records of herring spawning grounds, where maerl beds are often favoured. Confirming presence of this Scottish MPA network feature contributes to the scientific case for the Community of Arran Seabed Trust Scottish MPA proposal for south Arran, which remains in the running. Do auks get lost in the fog? It’s been almost a month since I last wrote a blog, with lots happening in the mean time. So far this season, we have ten tags back from shags on Colonsay. This may not seem a lot when you consider we’ve been working every dry day for the last month, but it just shows how time consuming the process is. Putting a tag on a bird can take a day but retrieving the tag can take three or more if the partner bird is always incubating when you walk out to the site……I’m pretty sure they don’t have a copy of our diary, but who knows! The data we’re collecting makes it all worthwhile though, it’s already challenged the perceived wisdom of where our seabirds travel to feed. Last year razorbills off Colonsay were going on short foraging trips (e.g. 21 miles) compared with the same species on Fair Isle which had to travel nearly ten times further (e.g. 194 miles) for food. Kittiwakes breeding on Colonsay also carried out short foraging trips compared with their northern neighbours on Orkney, one of which flew 144 miles – double the maximum distance that kittiwakes were thought to fly for food! Chris, Mara and Ellie are already working with kittiwakes on chicks on the East coast, whilst those on Colonsay (off the West coast of Scotland) have only just started laying their first eggs of the season. We won’t be tagging kittiwakes until the end of June when their eggs are ready to hatch. Yvan and Juliet on Orkney are currently catching shags whilst Rob and Jenny on Fair Isle already have razorbill and guillemot tracks back and their first auk chicks of the year. The auks on Colonsay are still sat on their eggs, a single large white egg for razorbills, and a rather striking large bright turquoise egg for guillemots. Rob and Jenny were rather amused by some recently obtained auk tracks that coincided with a period of thick fog; the birds appeared to be lost, zig zagging all over the place attempting to locate their colony! Aside from the normal day to day fieldwork on Colonsay, we’ve recently had Jane Smith, our artist in residence visiting. It’s great to see the creativity inspired by a day out on the seabird cliffs. Hopefully we’ll be able to combine the scientific side of the project with an artistic element culminating in an exhibition at the end of the project……keep your eyes peeled! There is never a dull moment here, with the RSPB film unit coming to stay next week too. Hopefully the weather will behave itself as we are planning on starting tagging the auks-keep your fingers crossed for us! You can find this blog and others from RSPB on their website. Seabirds, whales and dolphins have been left out of new plans to protect marine species in Scotland, The Scotsman has learned. A new network of protected areas at sea is to be created by the Scottish Government following a commitment made in the landmark Marine (Scotland) Act 2010.